"Brooklynite Jorge Day's musical CV includes synth duties in Wierd Records mope-pop act Plastic Flowers as well as production for sultry neo-wavers Lingerie, but when left to his own devices he crafts gritty skeletal house sketches under the Fast Times flag. 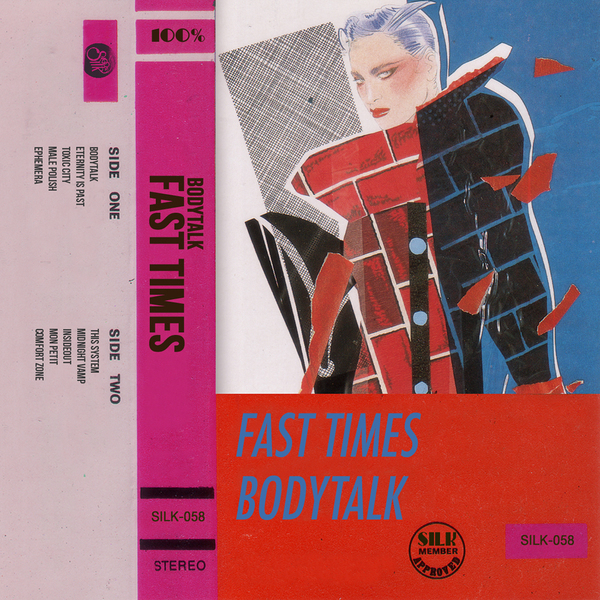 Bodytalk is his debut after a year of workshopping demos and touring Europe, and the results caress a spectrum of SILK sweet-spots: reverbed runway themes ("Mon Petit"), warehouse memory tapes ("Ephemera"), dirty drum machinery ("Eternity Is Past"), naked soul samples ("Toxic City"), luxe lo-fi hypnosis ("Male Polish," "Midnight Vamp"), etc. There's a starkness and crunch to these tracks that skews them more towards the proto-house vibe of various mid-80's analog sides, when productions were more about raw rhythms and melodic minimalism, instead of the prolonged tension-and-release model which dominates to this day. History aside, Fast Times makes background boombox gold, ripe for cranking loud and cutting loose. Expect more from this transporter in the near future. Mastered by Brian Pyle."